Since my husband has to work on Thanksgiving, we had our turkey four days early. (We’ll have another turkey on Thanksgiving without him.) As always, I took pictures just in case it came out tasty, and it really did! Last year I searched online and came across this recipe for a “very flavorful and moist roast turkey” which I’ve now made for my second year with my own modifications. The key I think is the butter and apples, the rest can be done as you like. Last year I made it in a bag and this year I made it in a roasting pan with a foil tent because I didn’t have the tablespoon of flour needed for cooking in a bag. Rinse off the turkey (inside and out) and remove the neck and giblets. I’ve forgotten to remove the neck and giblets more times than I’d care to admit, so don’t worry if you forget to do this. It’s really not any reason to open your oven and stick your hands inside a hot turkey. Core your apples and cut them up into large slices. Cut celery into 1/2 inch to 1 inch slices. Peel garlic. Cut onion into chunky bits. Mix all together in a bowl and set aside. 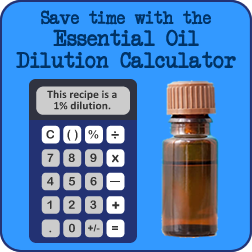 (If you don’t have fresh herbs, you can use dried herbs and toss them into this mixture, just be sure to save some for the outside of the bird as well). 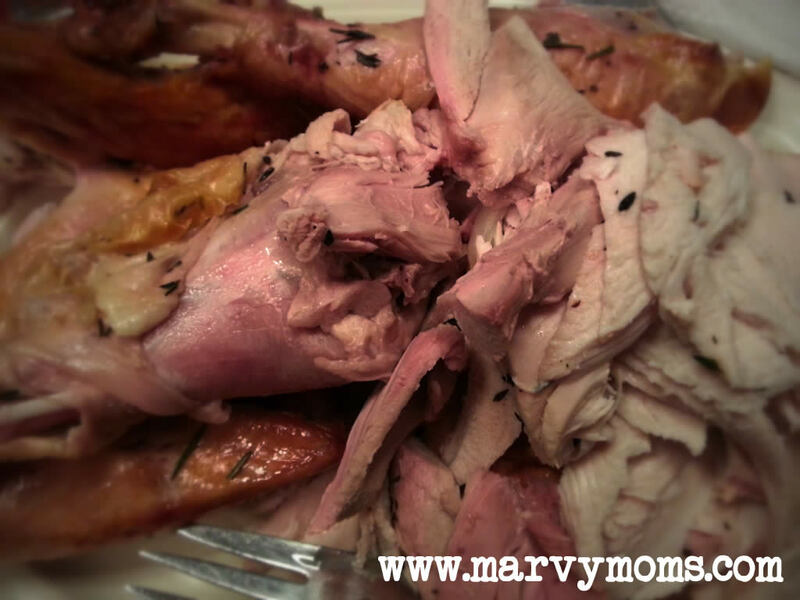 Massage the turkey and pull the skin away from the meat as much as you can. You really have to reach in there as much as you can. I mostly did this over the breast area, and had to remove my bracelet to keep it from being immersed. Slice your butter up into 8-10 pieces and then quarter those. Wedge these pieces of cold butter between the skin and meat. You may also want to stick a couple of cloves of garlic in there as well. Take your apple and vegetable (and spice if you’re using dried herbs) mixture and stuff inside the bird. If not everything fits, that’s okay, it just means you have a smallish bird. Just take extras and put them on top of your turkey or in the bottom of the pan. As you’re stuffing the above mixture into the bird, randomly stuff your fresh herbs in there as well. Salt and pepper the outside of the turkey to your liking. 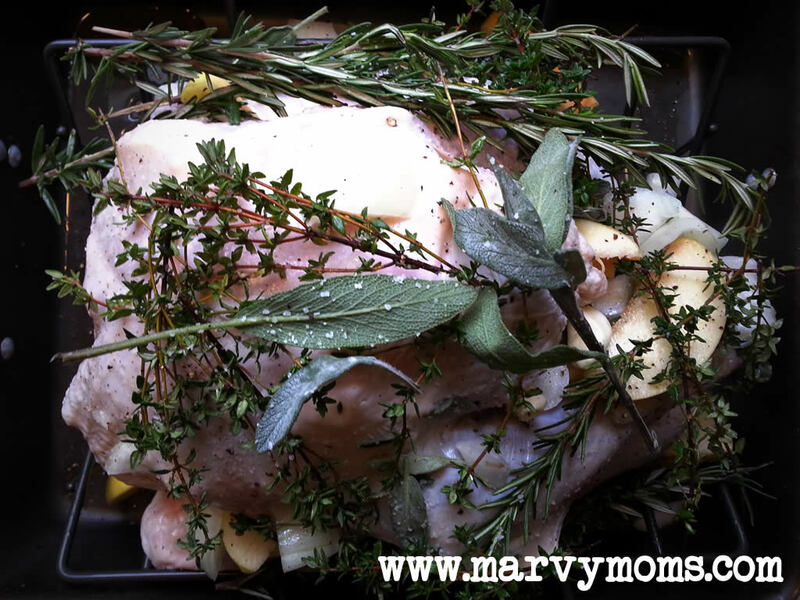 Decorate your turkey with more fresh herbs (see photo) and apple/vegetable mixture. Put turkey into preheated oven for 15 minutes. Reduce heat to 350°, and cook for an additional 15 minutes per pound. A foil tent is recommended for turkeys over 12 pounds, although I still used one for my 11.36 pound turkey. Cook until internal temperature is 165° at the thickest point of the thigh (without touching bone). I never know where this is exactly, so I check a few places where the meat is thick. Let your bird rest for about 20 minutes before carving. Thank your turkey for its ultimate sacrifice, carve, serve, and enjoy! I don’t usually baste my turkey, however, it seemed a little dry in there so part-way through I poured a glass or two of water into the pan to promote moisture. I have a convection setting on my oven. I turned convection on part-way through when I realized dinner would be late without it, but I’d rather cook it lower and slower. I made a note from last year that with the bag I would probably only cook at 325° next time. Take pictures and notes when you cook so that you can refer back to repeat successes and avoid repeating failures. As I mentioned before, the apples and butter are key to this delicious turkey. 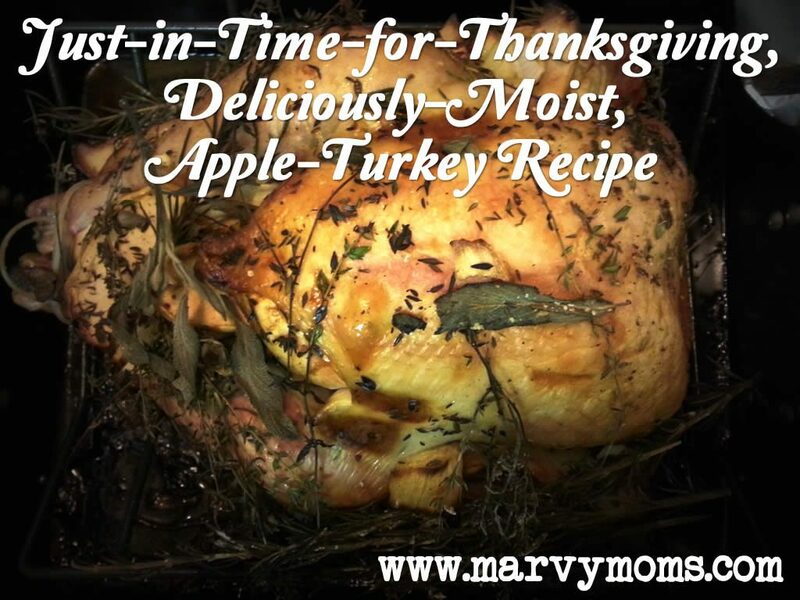 So moist and yummy! Happy Thanksgiving everyone! What tricks do you have for the perfect turkey?